THE Singapore Yacht Show officially opened yesterday in Sentosa Cove with 80 exhibitors, about twice the number of last year's show. Andy Treadwell, the managing director of Singapore Yacht Events, which owns the show, said the number of on-water displays has more than doubled, and the line-up of vessels on show range from superyachts "with all the on-board toys" to sport-runabouts and sailboats for first-time buyers. The turnout at this third edition of the show, held at One°15 Marina Club, is expected to be between 6,000 and 7,000; last year, the show attracted about 4,500 visitors. Commenting on the growth in figures, Mr Treadwell said: "It's a reflection of the growing demand of the growing industry." At the opening of the show yesterday, Superyacht Singapore Association chairman and One°15 Marina Club chairman Arthur Tay said the show had the potential to bring in tourism benefits the same way the Formula One Singapore Grand Prix does. "Modelled upon the Monaco Yacht Show, the Singapore edition is set to become one of the most important and strategic events, alongside the Formula One Singapore Grand Prix, to be hosted in our city state," he said. Mr Treadwell, picking up on this point, said one of the objectives of the show is to drive the "significant economic impact" that a growing yacht tourism and leisure marine industry can bring to Singapore and South-east Asia, if properly supported. "We at Singapore Yacht Events are looking for opportunities to collaborate with other important shows, governments and venues around the region to drive this growth," he added. One of the exhibitors at the show is Kingship, a Hong Kong based shipbuilder, which is offering its vessel, a 42m yacht christened Star, for US$15 million. Kingship's founder and managing director Roger Liang, speaking to reporters on board the vessel on Wednesday, sounded upbeat about the prospects for the yacht industry here. Government planners here have made provisions for the number of marinas to grow, he said; 10 years ago, Singapore had only one marina, but now, there are three. "Hong Kong is different. For Hong Kong, 10 years ago and today, it's still the same situation." 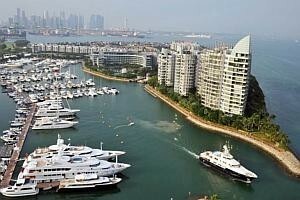 Hong Kong marinas are congested, and practically all slots in them have been taken up, he said. Hongkongers can't buy any boats because there's no space, he lamented. Coinciding with the Singapore Yacht Show on this April 18 to 21 weekend is Boat Asia, which has held shows here for the last 20 years or so. Its show is being held at Marina at Keppel Bay. The Boat Asia website said up to 16,000 visitors are expected, up from last year's attendance of 12,000.